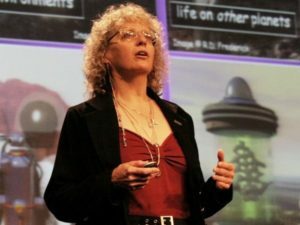 The Mars Society would like to extend its congratulations to Dr. Penelope Boston on her recent selection as the new Director of NASA’s Astrobiology Institute (NAI), a California-based body that plays a major role in performing astrobiology research, as well as providing scientific leadership for astrobiology space missions. While a graduate student at the University of Colorado in Boulder, [then Ms.] Boston was one of the founders of the Mars Underground and helped organize a series of conferences called ‘The Case for Mars’, both of which served as the inspiration for the eventual establishment of the Mars Society in 1998. She is recognized as one of the co-founders of the organization and served as a member of the group’s steering committee and board of directors. In addition, Dr. Boston became one of the early researchers at the Flashline Mars Arctic Research Station (FMARS) in Canada and the Mars Desert Research Station (MDRS) in Utah. Her long-term support of and commitment to the station crews as a part of the remote science team has paved the way for serious Mars analog research. “We are very pleased with NASA's decision to have Penny lead its astrobiology institute. Her expertise in extreme environments and the search for extremophiles on Earth has opened many doors for the search for life in our solar system, especially on Mars. We are excited for her taking on this leadership role to forward space exploration and NASA's current program to send humans to the Red Planet,” said Mars Society Executive Director Lucinda Offer.